WTF! I can't get the below space to go away! I've tried working in HTML and in Blogger's editor (both HTML and WYSIWYG). Looks like a blogger issue! I only wanted to format the post in tables so images at the left correspond with text on the right, this isn't too complicated!!! Somehow, the HTML conflicts with the blogger format. 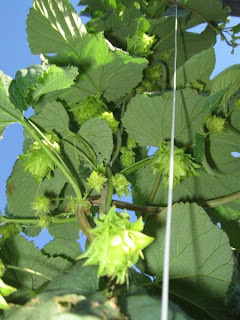 As you can see, we're nearing our first harvest for chinook. In a week or two, the cones will feather out a bit more. When they are light and papper-like, they are ready for harvesting. We typically get several harvests from the chinook. The cones are fairly dense as usually, and there are many more flowers coming in. This is chinook again, you can see how many new flowers are coming in. This particular vine is looking for more vertical room so I trained several tops to start working horizontally. I could easily give the three plants on the far east chinook section 5-10 more feet of vertical growth! You can easily tell the growth strength is highly energetic. To the left is a look up the chinook central vine. Though everything LOOKS healthy from these pics, we're under attack by squirrels and rabbits! Along with routine weeding, the top row always needs trimming. It was out of control today. The eastern chinook mounds were shrub-like masses. 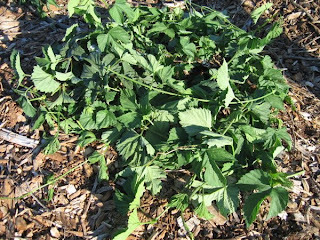 Vines were crawling up the mulch mound for 5 feet or more and other were jumping to other trellis wires. As you can see, only a small handful of plants have established themselves and found the trellis. They seem only more determined and I'm hoping they are adapting and will thrive. The literature says to trim back to only a couple of vines, so that energy goes toward cone production. 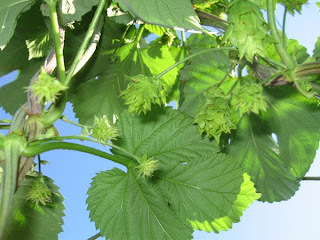 The chinook and even the centennial seem to not have limited cone production for leaf and vine growth. A key benefit to allowing build-up of vines to a shrub-like state is rodent deterrent. 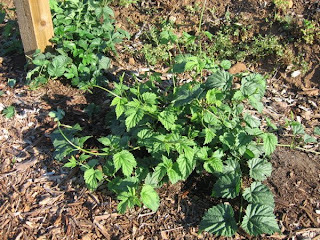 The abrasive texture of the stems and leaves provide an organic barrier from inevitable chewing residents such as gophers, squirrels, and rabbits. 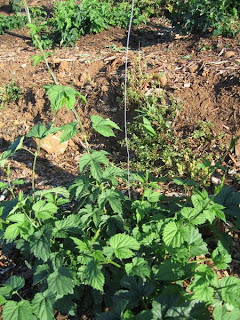 Only one of the centennial hop plants has established itself this year (left). This is the one at the end of the row. 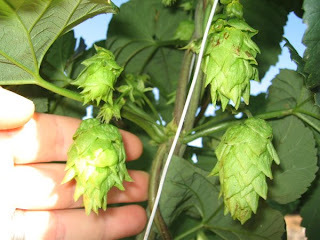 It has begun cone production and will be ready for a first harvest in about 3 weeks. 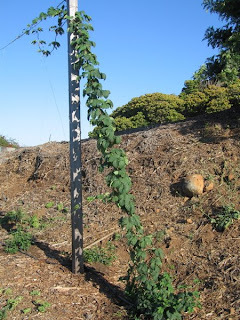 When it comes to hops, the vine tip is critical to continued growth. 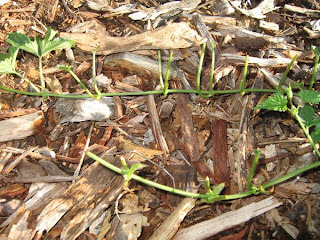 Once the tip is chewed or damaged, the vine will not continue to grow. Occasionally a stem will branch off from a main vine and continue to grow. This only occurs when the main vine is well established. To the left is magnum in the process of climbing. I just hope nothing chew off this main vine. I use magnum as the base hop for most of my lagers. I haven't a clue why those little furry bastards chew the vines. Last year (and years past) when vines have been chewed and crop was lost, I initially thought someone came by with a weed-whacker and accidentally cut them. Near the base, about 5-6 inches off the ground, was a really clean cut. There was no extensive chew marks though in a couple of instances, the wire was cut too! Its like a squirrel or rabbit came by to drink from the drip, got pissed off when there wasn't any water, and chewed the vine to see what that would be like. To the left is another magnum plant beginning its climb up the trellis. Since the days grow long and the weather is warming, I increased the water delivery to every 12 hours for 45 minutes. Most are on 0.5 gph drippers. The bottom row is mostly 1gph. Mid-July, I'll switch to 1 hour twice a day until the end of the season in October. The summers are very warm in this area of San Diego. 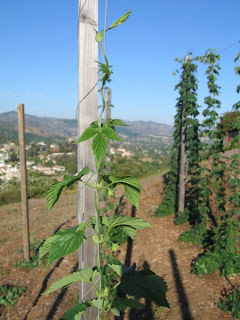 To the left is the magnum hop plant at the west end of the second row. Though I trimmed most plants, I left a good perimeter in order to protect the central vines. The hop farm is getting hit so hard this year by these herbaceous foes. I've got to do all I can to prevent them from chewing the main vines. 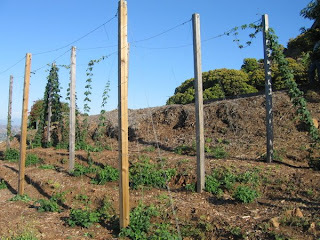 This year's strategy is to allow bushy growth at the base to deter chewing of the production vines. 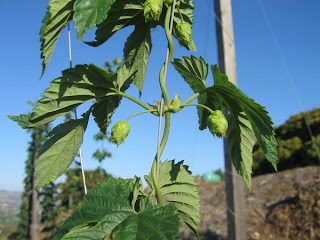 In the past, vines have matured with cones only to be chewed to oblivion.The chinook seems to have the advantage here over centennial, magnum, and vojvodina. 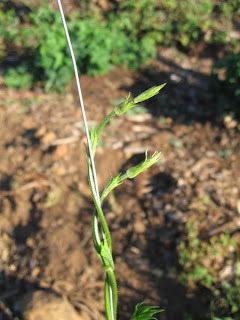 The stems sprout thick, hardy, and abundant. Also, it grows quickly early in the season. Centennial follows most of the characteristics with the exception of growing quickly. Others peak through the soil slowly, their tips highly vulnerable to those furry herbivores coming by to chew curiously or casually while drinking water from the drip system. To the left you can really see the damage on this vine, those furry bastards! Though I should get some chicken wire to stake around each mound, I'm going to try natural protection first. I decided to take the trimmings and surround the more vulnerable vines. The density of the hardy vines works as a deterrent. Not sure if this will work but its worth a try. This is one of the new plants on the bottom row. It continues to break ground only to have its tips chewed off.